She had hardly slept last night and now her hair wouldn't go right. She tried three times to place the pins with her shaking hands before she finally gave up and called Jane to help her. Jane, secure and settled in her own engagement, smiled a serene and knowing smile, and dressed her hair a remarkably becoming style. "What gown should I wear, do you think?" It was an absurd point, but causing her much anxiety. Jane looked at her thoughtfully. "Wear the one you like best." "I like best what will make him like me best, but I do not know what that is." She stared into her wardrobe with despair. "Jane, I am engaged to marry a man and I do not even know his favourite color. Does that not seem worrisome to you?" "I would bet he knows what your favourite color is." "Thus proving his superiority over to me as a lover." Jane put her hand on her arm. "This is the beginning, Lizzy. You have only just come to love him, while he has loved you for nearly a year. You must give yourself time to catch up." To catch up. "That still does not tell me what to wear." "As I said, wear what you like--what suits you." She reached in a pulled out a soft, butter colored gown. "That one? Why, I have worn that any time these last two years." "And worn it often, because you like it very much and know it becomes you." She looked at it dubiously. "I should not like to appear shabby--or out of fashion." "You will appear only beautiful, and like yourself," assured Jane. "I am sure that is all he will notice." So she descended the stairs, brown hair, brown eyes and a long-sleeved butter-colored gown. Breakfast was so slow, and the wait in the parlor so long. Elizabeth wondered if it would always be like this, and yet knew that it wouldn't. Surely she would be easy again soon; surely this anxiety and oppression of spirits would be lifted. The men finally arrived, and she watched him walk in, marveling. He looked serious, but his eyes found hers at once, and she felt the blood rise in her cheeks as she met them. She was wrong--he was composed, but he was happy, his eyes were full of it, and... uncertainty? Across the room he silently questioned her, as if wishing for reassurance that she did not regret her answer. She smiled back, shyly, trying to tell him that she was so very, very glad that they were here, standing awkwardly in her mother's parlor, a promise between them. I am glad too, his look replied. Mr. Bingley came around, and pressed her hand significantly. Then Darcy was there, and she could not look him in the eye so close up, but felt his cool, firm fingers clasp hers for a few moments longer than needed. For once she was grateful for her mother's eagerness to send her daughters off with their suitors, as a walk to Oakhum Mount was swiftly arranged. She could not breathe here in this house. In the hallway Mrs. Bennet asked her forgiveness for making her spend time with Darcy, and she did not know if she ought to laugh or cry. She put her bonnet on and felt him move nearer, shifting a little as if uncertain just how close he could come. The four of them burst into the sunshine, moving away from house, toward freedom and love and things unknown. Once they reached a good distance Mr. Bingley turned to her. "You must let me say how thoroughly delighted I am at the news Darcy told me, my dear Lizzy!" "We are all to be brothers and sisters now!" He beamed. "Or husbands and wives, of course." Husbands. Wives. She longed to look at Darcy, to study his face for hours, but could only cast fleeting glances around the brim of her bonnet. He grew more beautiful with each look, and she did not know how she would bear it. There was some conversation, she hardly knew of what, then the couples broke naturally apart. Bingley and Jane, being much the less assertive walkers, fell behind, and it was just the two of them, on a path winding through fields and trees, and turning a corner just ahead. They walked together without touching or speaking, waiting by some mutual consent until the distance between the two couples grew sufficient for private conversation. When Darcy finally spoke, his voice sounded tentative. "I hope you do not mind that I told Bingley." "No, no of course not. I told Jane, after all, and it is almost the same thing." "Very true." Another silence. "Will you not look at me?" She did then, blushing and smiling. "I am sorry. It is just so..."
"I know," he said. The look he gave her was tender. "I have loved you a long time, Elizabeth, and the assimilation of my own happiness is slow. I half feared I would come to the house this morning, and you would look at me with the same coldness as before." "Oh, no." In a moment she had forgotten herself, and thinking only of his feelings, touched his hand in fleeting reassurance. "No, you must forget that I ever looked at you that way. I was a fool." "Far less than I." His hand pursued hers, and clasped it, though still fleetingly. They wore gloves, of course, but these little touches were so new, and so significant, that she felt a bit breathless. Lizzy found herself glancing over her shoulder to check how far back Jane and Bingley were. She could still see them, further down, through the trees. "I thought you would never wish to see me again," she blurted out after a moment. They had spoken of this briefly the day before, but somehow she could not help returning to it. "Never wish to see you again?" he repeated. "Surely you could not believe that. Even if circumstances had truly divided us, it would not be by my wishes. You must have seen," he went on, turning towards her, "while we were at Pemberley, that I still loved you--that I wished ardently to please you." She colored happily. "I did suspect it, but it was so very extraordinary, that any man would love a woman who had treated him so infamously. Your behavior astonished me beyond expression, and I was still attempting to decide my own wishes when Jane's letters came. And then--and then, how could I possibly expect more from you? Lydia's behavior alone would be enough to turn most men away, and the connection with Mr. Wickham! Or course I did not expect to see you again." "Did you not say" -he stopped walking and she with him-- "that everything strengthens what is strong already?" They stood opposite each other, looking, perhaps for the first time that day, properly and fully into each other's faces. "When I watched you weeping in the inn that morning, I thought I had never loved you more. Wickham's infamy only increased the intensity of my feelings--yet I had no right to say anything, or do anything that day, except to offer what commiseration I could, and to secretly determine to help." "And when you left, I knew then what I really wanted. It seemed bitter, though just, that I should desire your regard just when I had lost it--that in the very hour you walked out of my life, I knew that I could have, would have loved you, that you were of all men the one most suited to me." The air was so very bright between them, the trees overhead throwing only occasional shadows over their shoulders. Darcy looked down at last, away, and back again. "Could have?" "It was Lady Catherine," she said softly, "who made me realize that I already did." That same pattern of looks again--down, away, back again. "How is that possible?" he asked after a moment. "You did not love me yet at Pemberley, I know you did not, and then we did not see each other, except when I visited with Bingley, and then we did not speak. Could you have fallen in love with my absence?" "With my better understanding of your character; with--oh, I don't know!" The soft murmur of voices behind them alerted them that the others were drawing nearer and, as if by mutual consent, they both turned and began to walk again, with rather quick steps. "I cannot explain it. But I thought of you so much during those months, and the more I thought, the more my feelings changed and warmed, and when you came again--oh, I expected nothing, but hoped for everything!" "As did I," he said, and his voice had grown stronger and warmer again. They walked in silence a little bit more, as if driven to be away. They came to a spot where a smaller path diverged from the main, and Elizabeth paused by it. "Will you come this way with me?" The trees were heavier here, and the leaves crunching thickly underfoot. Their steps soon slowed to the barest amble, and they each took their turn at long, admiring looks in the quiet. "I believe," said Darcy at last, clearing his throat, "that I should speak to your father this evening, if you are agreeable." "It should not be put off any longer." "I want your family to know." She was moved by the sentiment, even as she found herself wishing that they could have more time like this, without scrutiny. "I only ask that I be the one to tell my mother--tonight, perhaps, before bed." It had been a remarkably still day, with only the occasional leaf drifting lazily down. In the thick trees, one landed on Darcy's shoulder, and then another on the brim of his hat, and Elizabeth found herself smiling. "Nothing at all, only--" She hesitated, then lifted a hand to lightly brush his shoulder. "And--" She lifted her hand further, and Darcy, realizing that she was reaching toward his hat, bent his head. She lifted the leaf off, but as her hand came down he caught it, and held it, suspended between them for a long moment before he gently kissed it. Men had kissed Elizabeth's hand before, of course, but usually with exaggerated gallantry, never this seriousness. She and Darcy had hardly touched the day before, really; there had been too much to feel and too much to say, and a lifetime's habit of constraint is not overcome in a moment. As if he had read her mind Darcy spoke abruptly, still looking at her hand. "Before today, there were only four occasions on which I touched you." Her throat constricted, and she could not speak. "We danced at the ball at Netherfield, you took my arm once when we walked in the grove at Rosings, I handed you into the carriage the day you first came to Pemberley. And... yesterday, when we walked, a little bit." His eyes flew to hers. "Will you call me that?" His lips curved a little. She blushed. "I--I do not know. I hardly know what to call you. Would Darcy be better?" "No. Not when we are alone." His hand shifted on hers, clasping it firmly. "Only my sister ever calls me Fitzwilliam now." "Perhaps there would be a confusion of names within the family." "Indeed." He relaxed and smiled more. "When I was a boy I used to wish I had been named John or Edward or merely William--any ordinary name." Of course. She should have known. "It might be easier if you had an ordinary name, but I must say that I think Fitzwilliam suits you. It has a dignity and distinction which a mere John or Edward could never hope to attain. Besides, I knew an Edward when I was a little girl. He was a very fat and unpleasant boy who pulled my hair and tore my dress. I have hated the name ever since." "Then I am glad I am not named Edward." After a moment's hesitation they began to move again, though dawdling, their two hands still clasped between them. It was strange and exciting, to walk thus, with this immediate physical connection between them, with the warmth of his hands seeping through her gloves and up her arm. He was so much taller; she felt the difference more now, for some reason. The trail grew very narrow and Darcy frequently reached out to lift branches that might have tangled in her bonnet or her hair. They were almost painfully close, but still not touching but for their hands. Darcy broke the silence with a return to their previous subject. "I may speak to your father after dinner, then?" "That he will refuse me." "No." She shook her head. "I do not fear his opposition. It is only that..." she sighed. "I was too immoderate, Fitzwilliam. I spoke my dislike of you too freely, with too much spirit and foolish wit." A short silent passed, then-- "You do not like admitting you were wrong?" His voice was a little flat. "No, no! At least, I am ashamed of myself, of my behavior, and that must give pain, but I will take pleasure in naming all your merits to anyone who will listen. It is that my father will be grieved and anxious for me, though I hope to quickly convince him that he need not be. You must forgive--you must forgive anything he says to you that might give you an idea of my sentiments in the past. Or any coldness on his part. It will be a very great surprise to him." Darcy accepted this silently, but when she looked anxiously at him he did not appear distressed by it. Without thinking she tightened her grip on his hand, and immediately he turned his head and smiled at her then stopped, pulling her closer. He looked down at her, ran a finger down her cheek, and murmured. "If I could write the beauty of your eyes..." and paused. "I hope you will forgive me," he said with a smile, "for I still believe poetry is the food of love." "I thought that was music," she said inanely. He let her go eventually, and they carried on without touching again and spoke only of passing subjects. Perhaps they had both had as much intimacy as they could bear just then. They eventually reunited with Jane and Bingley on the Mount, where the atmosphere immediately lightened. Those two lovers had been together long enough to be more easy, and several minutes of cheerful and sensible conversation did a great deal to lessen the tension between the two new ones. They walked back together, the girls telling stories of their childhood explorations. It was Bingley who laughed loudest, but Darcy's frequent smiles spoke more eloquently to Elizabeth's senses. He was happy, she could feel it, although it was a happiness that perhaps overwhelmed him a bit, even as it overwhelmed her. When they arrived home there was no choice but to part again, at least briefly, and the afternoon crawled past as they sat in the same room, unable to speak, while Mrs. Bennet nattered on about nothings, Mary read aloud her improving excerpts, and Kitty sighed her boredom disconsolately. If anyone thought it strange that Mr. Darcy as well as his friend should feel it necessary to remain the whole afternoon, no one remarked on it. Elizabeth found herself wishing that he had returned to Netherfield for an hour or two, rather than sit here and bear this. All was made worthwhile, though, when he eventually approached her and made some remark about the shrubbery in the back. She answered him, and after a moment said, "Would you care to see it? I will be glad to show you if are interested." "I would enjoy that," was his only reply, but a warm look gave her better thanks. As they went from the room Mrs. Bennet leaned towards Lizzie and whispered as she passed, "I am very grateful to you for taking him away, and I know it is a sacrifice since you dislike him." She would have gone on but Elizabeth, blushing lest Darcy have heard her, offered a confused reassurance and moved away. If Darcy had heard he showed no sign, but followed her silently from the house. All the windows of the sitting room currently in use looked out over the garden, as well some from Mr. Bennet's library, so they had gained only privacy of speech, but still, both breathed a sigh of relief. "I am glad you are to speak to my father this evening," said Elizabeth. "I do not know how much longer I could tolerate this pretense." "I have never liked disguise of any sort," agreed Darcy, then colored rather deeply. Elizabeth was puzzled, at first, to account for his expression, until she remembered that he had said something very similar in their fight after his first proposal. "It is a good quality," she said, bowing her head to hide her smile, "if used judiciously." Then, more seriously, she looked up again. "I am glad that I can trust you to tell me the truth, and not hide things from me." He returned the look. "And you as well, Elizabeth?" They said little after that, but strolled slowly through the autumnal colors. At last they sat down by mutual consent on a bench facing the wall of windows. She put her hand down next to her. He did the same and they sat there, almost but not quite touching. She heard him swallow next to her. "I shall be a candidate for Bedlam if I do not get to hold you soon." The pronouncement, so unexpected and so unlike him, startled her into a laugh. Blushing, she stifled her giggles against her hand. He smiled rather ruefully, quirking an eyebrow at her. "You laugh, but I have been wishing for such an opportunity since at least March--no, let me be honest!--since November of last year. Now that I am so close to achieving it, waiting is intolerably difficult." "We were alone for much of today, sir," she reminded him. "And yesterday." He shook his head. "I would not take such advantage of you. Not when our engagement is still secret, and you still accustoming yourself to the idea." "And you have need no such accustoming?" He paused a moment. "I doubt I will ever accustom myself to such happiness, Elizabeth, but that does not mean that I am not eager to embrace it." And her, apparently. Elizabeth could not pretend to herself that she did not find the prospect pleasing, and the air grew thick between them until finally, finally in the house the bell to dress for dinner rang. She sprang to her feet and spoke for both of them. "Oh, thank heaven!" Dinner was as awkward as it had been the night before. Already she longed to be at Pemberley, and pondered the merits of elopements. They had managed to procure seats together but said little, though she was touched when he bestirred himself to compliment Mrs. Bennet on the partridges. After dinner Darcy followed her father to his library while she sat in miserable agitation. Then it was her turn, and she felt anew the mortifying truth of her own folly as she tried to explain how she could come to love a man she had once so proudly claimed to hate. By the end, however, her father was pleased and reassured, and spent some time laughing at her expense. Though she would not be really easy until the engagement was announced publicly and all early disbelief, exultation or censure had passed, it was her father's opinion that had a mattered the most to her, so she reentered the parlor with a lighter heart than she had left it. Darcy was seated not far from Bingley and Jane, but appeared little occupied with what was passing between them. He looked up as she entered the room and she smiled at him, as he had done at her earlier. She though he looked relieved, and went to sit as near to him as she could. Unfortunately, that was not close enough for confidences, so it was only with a nod, a significant look and another smile that she was able to encourage him. She took up her stitchery again. After a few minutes he said, "Miss Elizabeth, I believe you might see your work better if you were to take my seat; it is closer to the fire," and stood up. Uncertain as to his purpose but certain that he had one, she acquiesced immediately. Rather than leaving her, he remained by the chair and, bending lower, spoke softly to her. "Were you able to reassure him?" She smiled a little. "He thinks as I do now--that you are the best of men." He shook his head. "That is not what I meant--though I thank you for it." "I told him," she whispered, turning her head toward him, "that I love you." He was such the master of his emotions, but she could see the feeling flood his eyes before he straightened and turned away. She understood; a crowded drawing room was not the place to be overcome by tender sentiment. There were no more moments alone that night. After all company had left she broke the news to her mother, endured her raptures, and went to bed bemused, starry-eyed and full of secret rapture. Of course it was not at all the same as it had been yesterday. There was no hope that either she or Mr. Darcy could escape Mrs. Bennet's notice, nor were any long walks in the woods suggested for a third day. Mrs. Bennet was blessedly awe-struck and that made it bearable, but Longbourn had never been more confining. It was a pleasure to watch her father emerge from his room to make conversation, and to see her betrothed take pains to reply, but still she felt a queer, empty ache inside, a dreadful need to be near him, and the violent wish to drag him away somewhere they could be alone. She laughed at herself, a little, for being so maudlin--or perhaps it was an excess of sensibility. But still the feeling stayed and she could hardly make conversation or even listen to what was being said, for all her being was so concentrated on him, where he sat four feet away. He was infuriatingly composed, returning his usual thoughtful and well-worded comments, looking cool, unflustered and unhurried. Her own mind was in almost as much disorder as her emotions--a point which became clear when she suddenly realized that her father had spoken to her, and both he and Darcy were waiting for her reply. She blushed. "I beg your pardon," she said. "I did not hear what you said." "I merely suggested," said Mr. Bennet, clearly amused, "that, seeing as the parlor appears to be rather oppressively crowded, you might prefer to take Mr. Darcy here outside to whichever part of the gardens you deem suitable and discuss," he waved his hand, "all the things that young people in love always have to discuss. Perhaps something of what has been occupying your mind just now?" His teasing distressed rather than amused her, but she agreed quietly and stood, as Mr. Darcy did the same. "I would be quick about laying possession to the corner you want," added her father, "or Jane and Bingley may get to it first." Her face burning, she led Darcy from the room. He said nothing as they emerged from the house, only lengthening his strides to come even with her. This was precisely what she had been wishing for, but she was too embarrassed at first to enjoy it. Darcy was as quiet as he usually was, and it occurred to her that she liked that about him--she liked the sedateness of his manners, the restful calmness of his composure and presence. What once had offended her now soothed her, since she knew the feelings that lay beneath it, and as her own feelings suddenly rose to near bursting, she seized his hand and began to lead him down the garden paths. He came willingly, matching her quick, short strides with his own long ones. "Where are you taking me?" There was amusement in his voice. "Away from the house," she said. They took a short cut through the shrubbery, past the first walls, and still further on, the knot garden and the herb garden, the abandoned topiary, all of them visible from the upper floors of the house. Finally they passed another set of walls, higher this time, and Elizabeth led him to a one overgrown with ivy and honeysuckle. With unerring accuracy she fumbled through the greenery, and opened a small door behind. Darcy followed her through the curtain into a small, enclosed garden, much neglected. The gravel path that ran round it had weeds thrusting through, the little pond was green with algae, and none of the shrubs had received more than the most cursory of trimmings--yet, it was not without beauty. "I used to come here all the time when I was a girl," said Elizabeth, running her hand over the tops of some late irises still growing by the path. "It was my refuge." "Does no one else come here, then?" "Jane sometimes, perhaps. I do not know of anyone else." His hand tightened over hers. "We are alone, then." "Yes." She turned to him. "I love you." The words came bubbling out. He drew a breath, and in the same space of time his arm wrapped around her waist, drawing her close. "How I have longed to hear you say those words," he murmured. He touched her face with infinite tenderness, and Elizabeth felt she could bear no more. "That is good," she managed, "for I feel myself likely to repeat them often." "Very often, I hope." His hand slid down her cheek to her throat then moved behind, angling against the back of her neck. "I will do the utmost in my power to inspire them." She could see it in his countenance now, the desire and purposeful intent. And yet he hesitated, caressing her neck lightly, as if in some part of his scrupulous sense of honor he still feared imposing on her. Elizabeth, who had no such scruples, reached up and pulled his head down. They remained in the walled garden for some time, talking a little, but standing together, arms around each other, Elizabeth leaning against him. This closeness, so new and so much desired, was not to be relinquished easily. Periodically she would hear him sigh and press a kiss to her head as his arms tightened a little, as if afraid she would disappear or run away. For her, the world had happily shrunk, for now, to the warmth of his body, the steady beat his heart against her cheek, and the rise and fall of his chest. She closed her eyes, shutting everything else away. After an unknown period of time she felt him stir, bend a little, and speak into her ear. "Elizabeth," the word was full of love, "as loath as I am to let you go, your father will never let us out of the house again together if we do not return soon." She raised her face, smiling, and was promptly kissed. "A ruse!" she cried, laughing, when he drew back. "A very sly ruse, sir!" "No ruse," he answered calmly, letting her go and drawing her arm through his own, "but an opportunity too pleasing to be ignored." "You say that now," she replied, "but I am determined to suspect you, and spend inordinate time plotting ruses of my own in return." The went out the little door, shutting it behind them. "I would by no means suspend any pleasure of yours," said Darcy with a smile, "but I hope you know you need no ruses with me." She looked at him through her lashes. "No?" A moment later, she found herself trapped against the brick wall and ivy, his eyes only inches from hers. "No," he whispered, just before he kissed her again. "Only ever look at me so." She had hardly slept last night, and very much feared it would soon affect her looks, but after all she had already captured the heart of the handsomest man in Christendom, so what had she to fear? Jane smiled even more knowingly at her distraction and fixed her hair again. "Will it always be like this, Jane?" she asked, half laughing, half sighing. "I do not know, but I hope it may be." "I love him more today than I did yesterday, and yesterday more than the day before. In another week, another month, another year! how much will I love him then? Can the human heart hold so much?" "Your heart, Lizzy, is capable of boundless love, as I know very well. Now that it has found so worthy an object, what is to stop its affections from growing, for one year or fifty?" "Indeed, I hope you are right. No, I know you are." She clasped her sister's hand. "Until now, Jane, you were nearly the only person I could love unreservedly, and think full well of. I cannot imagine not loving you, and now I cannot imagine not loving him, having seen the man he really is. He deserves it, all of it, and as long as he remains deserving--and he will--then I suppose my heart must respond." Jane squeezed her hand in response. "We are going to be very happy." "Oh, yes. Oh yes, I intend to be very happy indeed." "Mr. Darcy will be very happy too. I will see to it." Then she smiled an impish smile and rose to go downstairs and greet her betrothed. 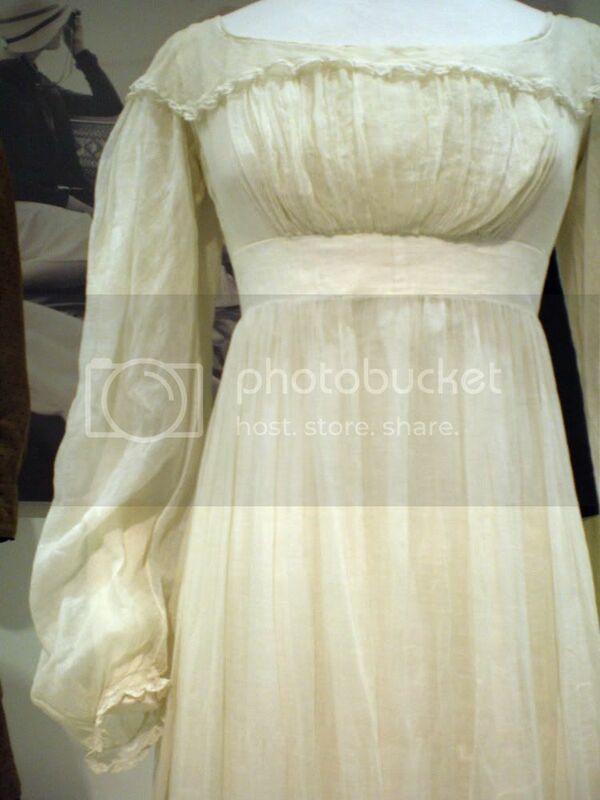 Author�s Note:I'm not one to usually need exact visuals, but I picture Elizabeth's butter-colored dress as looking something like this (only more yellow).